We have guests... unannounced visitors have made a nest in the flower box of the kids' swingset fort. I'm thinking these 5 robin's eggs will probably be abandoned. E noticed them today when he was playing, but who knows how long they've been there. He was sooooo excited, as was I. It's amazing to see nature so up close. Two years ago, we had robins make their nest in our hanging flower basket. 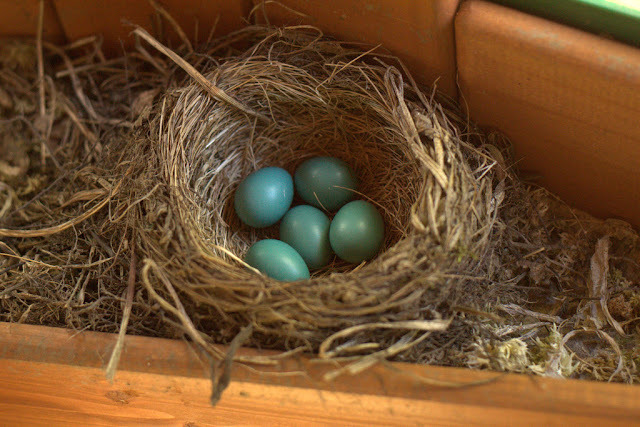 We were able to see the entire process from eggs to baby birds flying away on their own. We had success! Everyone kept warning us that many times the babies don't all survive, but ours did and I'll take that as a personal accomplishment. Yes, I know, I had nothing to do with it.